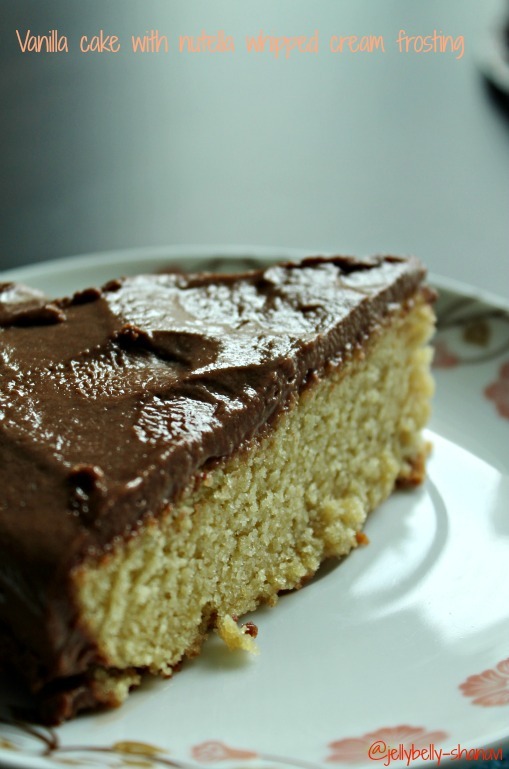 A simple vanilla cake (with egg) with nutella frosting, never thought would be this awwwwesome but it turned out to be a one. Preheat the oven to 200 deg C for 10 minutes. Grease the baking pan with butter and line the base with parchment paper/wax paper. Then again grease the top of the waxing paper and the sides of the tin with butter/oil. Bring the butter ,milk and the eggs to room temperature. Better take it out of the fridge an hour before u start ur prep work. Sieve the flour ,mix the baking powder with the all purpose flour and mix well before sieving in case if u don have self raising flour. Beat the butter first to a creamy ,light and fluffy. Later add the powdered sugar and cream. When the mixture is light ,pale n creamy,it's time to add eggs. Add one egg at a time ,beating each time thoroughly to blend with the mixture. If you see ,the mixture curdles while adding eggs,add a tablespoon of flour to the mixture before adding the next egg and beat again.Repeat the same step until u r finished with the eggs. Add in the remaining flour and the milk simultaneously and beat /blend well. Add the vanilla essence and mix well. Do not over beat the mixture. Just blend everything together until the batter has a dropping consistency. Check if the cake is done by pressing the center ,if it springs back it's done or insert a toothpick in the center ,if it comes out clean, baking is done. Otherwise bake it for few more minutes. Keep the cake aside to cool for at least an hour before u frost it. Chill the mixer blades/whisk ,bowl in the freezer for at least 10 minutes. Using the mixer at high speed beat the whipping cream to a stiff peaks. 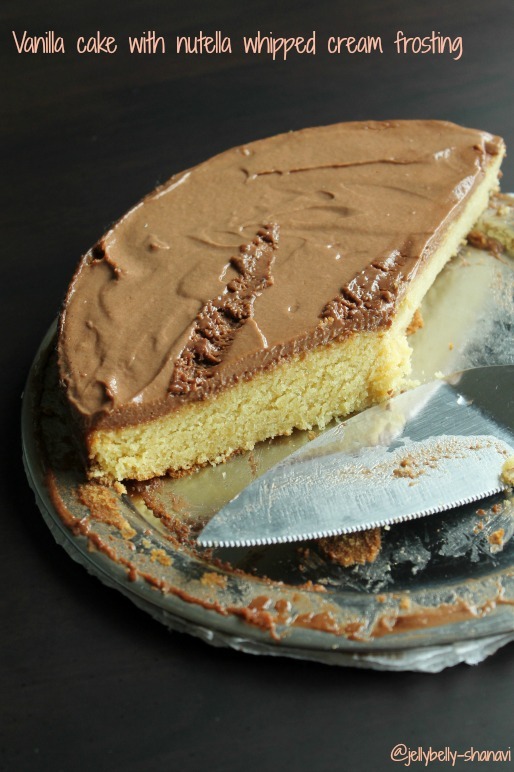 Now gently fold in the nutella using a spatula and slowly mix them thoroughly. Refrigerate the cream mixture for few minutes and then frost it on ur cake and njoy. U may also cream butter and sugar together but am told to cream the butter separately so as the water content in the butter might be relatively high for diff brands. So, it would be better to cream separately which in turns reduces the curdling while adding eggs. This cake stays good for 3 to 4 days . To tell the truth,I did feel the cake was bit eggy.I could really taste the egg in there which I's not looking for. The frosting was awesome.. u may eat as such. U can make a mousse if u slightly tweak the recipe which I'm on it already. Just fill the dessert glass with the cream and refrigerate for half an hour and u have an easy peasy and tasty dessert ready. Yummy looking cake. Wonderfully prepared. 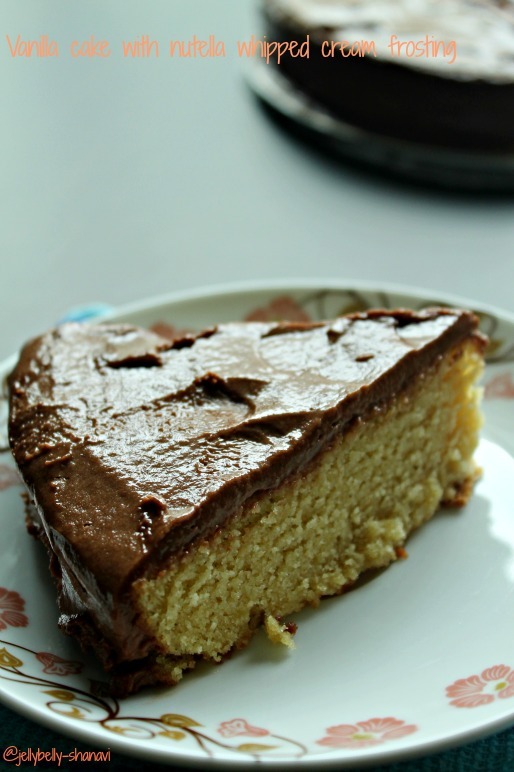 Machi kalakkure.lovely sponge cake.Can we add some cocoa to make a chocolate sponge cake? I am planning for a b day cake,for which i am asking. Wow moist and so delicious,great clicks dear. Delicious sponge cake and awesome frosting. Can't resist myself to have bite...Looks so fluffy and rich.. Wish i have a slice rite now, irresistible and beautiful looking cake.